While demonstrations were held in major cities around the world on 1 October 2018 in celebration of the declaration of independence of Ambazonia one year earlier, Ambazonia itself was in stark contrast. Where celebrations filled the streets of Ambazonia last year, this year was affected by a complete lockdown decreed with an eye on the upcoming elections. Curfews and a ban on public gatherings have been put in place to frustrate political campaigns in view of the upcoming presidential poll on 7 October 2018. The lock-down and fear of clashes have forced some people to migrate away from Ambazonia. On Monday Oct. 1 , Cameroon’s Anglophone separatists marked the first anniversary of their self-declared breakaway state, the Federal Republic of Ambazonia (Southern Cameroons) in a somber mood. This was a marked difference from last year’s outpouring of celebrations and rhetoric by locals to unilaterally and symbolically declare independence of Cameroon’s two English-speaking regions. That was because both the Cameroon government and the separatists themselves had decreed a total lockdown for the date, Oct. 1 [1 Oct. 2018] and beyond—with an eye on a contentious national election less than a week away. In order to circumvent the type of massive mobilization of English speakers which saw thousands on the streets last year, the government placed restrictions on movement. In the north-west region, movement of persons from one sub-division to another was prohibited for a period of 48 hours, spanning from Sunday Sept. 30 [30 Sept. 2018] to Monday Oct. 1 [1 Oct. 2018]. The public gathering of more than four people was also temporarily outlawed. This added to a dusk-to-dawn curfew earlier in place. In the south-west region, similar restrictions, including shutting down of all businesses, suspension of socio-cultural meetings, closure of motor parks and ban on circulation, were instituted by local administrators. 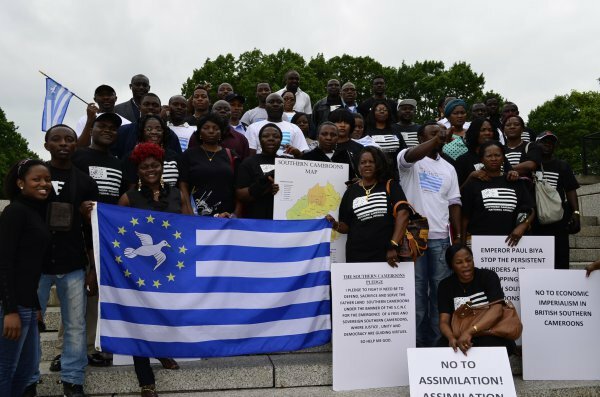 However, despite the measures, pro-independence English-speaking Cameroonians hoisted the blue-white flags of Ambazonia, and chanted their national anthem in some towns like Muyuka, Santa, Pinyin, Fontem, Ndu, Bafut, and even in far-off London where demonstrations took place. For their part, separatists started enforcing a lockdown expected to end on Oct. 10 [10 Oct. 2018], in a bid to frustrate political campaigns and a presidential poll on Oct. 7 [7 Oct. 2018] in the two English-speaking regions. The lockdown and the fear of being caught up in fresh clashes sparked the mass exit of people. Thousands of residents in the north-west and south-west regions have crossed over to the French-speaking parts of the country while others have gone abroad. In the south-west region alone, the International Organization for Migration (IOM) estimates that 246,000 people have been internally displaced, with a further 21,000 having cross over the border to Nigeria as refugees. To enforce the lockdown, separatists have sabotaged bridges linking different localities and used trees to block major highways in the restive areas. On Sept. 30 [30 Sept. 2018], no fewer than five vehicles were set ablaze along the Kumba-Mamfe road and the wreckages used to block the road. Gunshots were also heard in towns like Buea and Bamenda, while clashes between the warring parties get more frequent and deadly. Armed separatists are determined to forestall any election in “their region.” However, Paul Atanga Nji, Minister of Territorial Administration has said the presidential poll will take place across all 360 sub-divisions of the country, including those in the embattled English-speaking regions. The race for president involves nine contenders, including incumbent Paul Biya, 85, who is seeking to extend his 36-year rule by another seven years. Biya is campaigning on his “force of experience” to floor his eight challengers in the Oct. 7 [7 Oct. 2018] poll. There is little likelihood the incumbent won’t win. Besides the fact that Transparency International says elections in Cameroon are often marked by irregularities, the challengers will have to share opposition votes, giving Biya an edge in a one-round election in which one requires just the highest number of votes to emerge winner. President Paul Biya has reiterated his resolve to end the conflict which started as a modest protest by English speakers against real and perceived marginalization by his Francophone-dominated government. While launching his bid for re-election in the northern city of Maroua, on Sept. 29 [29 Sept. 2018], he claimed the state had overcome the toughest ordeal in the conflict-ridden regions.